A movie starring Tom Hanks, directed by Steven Spielberg and written by the Cohen brothers? Yes, please! Bridge of Spies is a Cold War-era thriller that follows the story of an insurance lawyer named Jim Donovan. When a Soviet spy is captured behind enemy lines, Donovan is called to defend him in court, making it look like the spy received a fair trial. As the trial moves on, things become far more complicated than Donovan could have ever imagined. Even if the movie feels like two distinct stories rolled into one, Bridge of Spies offers up a suspenseful plot and moving subject matter that help to make it a great thriller. It’s the type of film that immediately draws you in and in turn, makes you feel a bit sad it’s all over when the credits roll. Surprising no one, Tom Hanks is phenomenal in Bridge of Spies. I feel like Hanks is reaching a point in his career where nothing he does is phoned in, and if it means we get to see more roles like this, then that’s a wonderful thing. However, the actor who really caught my attention was Mark Rylance as the captured Soviet spy, Rudolf Abel. He delivers an honest performance and he brings to life one of the best monologues in the entire movie. 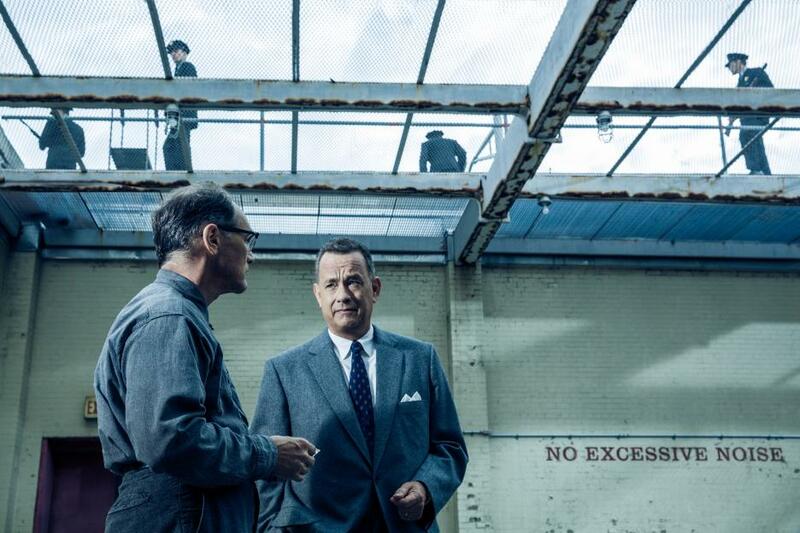 Mark Rylance as Rudolf Abel and Tom Hanks as Jim Donovan. Bridge of Spies also offers up a compelling story that heavily relies on Cold War-era themes that can be applied to today’s politics. The movies plays out like a two-act play, with one half feeling significantly different than the other half. However, the themes it highlights serve as the strings that tie the two together. Spielberg asks the audience to look at America through the lenses of the Cold War to say something about our views of foreign policy today. This works well for the most part, as it all wraps up into a moving conclusion to both stories. As I mentioned before, this film feels like two stories wrapped into one movie, and the seams between the two definitely show. The tone shifts significantly moving from the first perceived act into the second perceived act, and that would be okay if the shift didn’t feel a little underwhelming. Perhaps the subject matter in the second half of the film was mishandled to seem a bit more light-hearted when it shouldn’t have, or maybe the trailers just gave too much away for there to be any noticeable fear. Either way, it took me out of the experience. Bridge of Spies may have its flaws, but it’s still a serviceable (and quite good) Cold War-era story. Will it garner Oscar attention? Possibly. That will all be determined by the quality of movies still to be released. For now though, if you’re thinking about seeing Bridge of Spies, I highly recommend you do so. What did you think of Bridge of Spies?